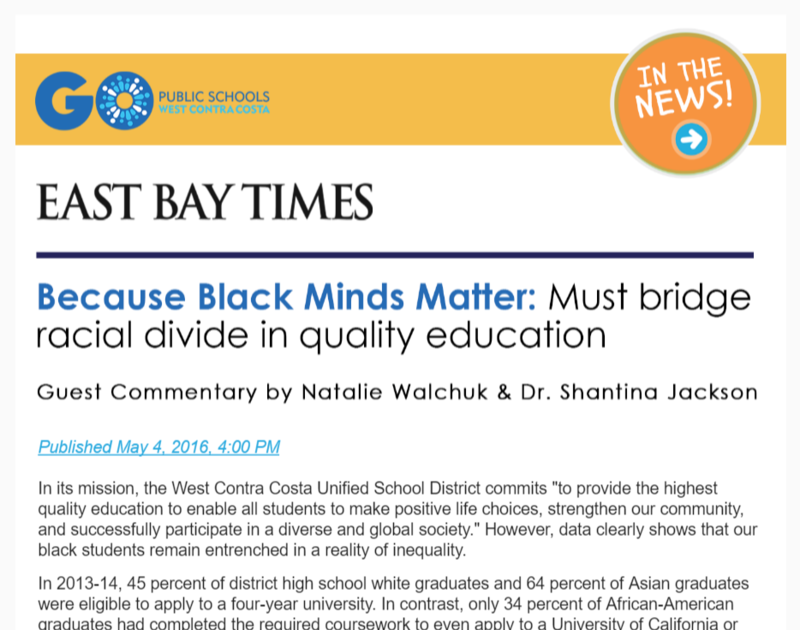 On Wednesday, March 4 in an op-ed placed in the East Bay Times, our Executive Director Natalie Walchuk and Leadership Council member Dr. Shantina Jackson called our community to action around transforming outcomes for our Black youth. Our students are counting on all of us to commit to the conversation. Please take a few minutes to read the piece, share and engage in dialogue with your networks, and encourage folks to attend Black Minds Matter. Unfortunately in West Contra Costa, our education system is failing our black students. Too often, at our schools with large black student populations, funds are scarce, teachers struggle to thrive on limited resources, and parents — their spirits already stretched thin by the challenge of simply providing for their families — feel disempowered and unheard. Dr. Shantina Jackson, born and raised in Richmond, has been a STEM education leader in the Bay Area for over 15 years. In her current role as Director of Community Engagement at Girls Who Code, Shantina drives community partnership, diversity, and inclusion, and scales computer science programs at the national level, working to close the gender gap in technology and engineering. Shantina previously worked as a math teacher at Richmond and El Cerrito High Schools, and with the Level Playing Field Institute eliminating barriers for students of color in STEM. She earned her PhD and Master’s in Education at UC Berkeley, and her undergraduate degree in African-American Studies from UCLA. Her research interests focus on the intersections of race, gender, and African-American educational thought. Natalie Walchuk, Executive Director of GO Public Schools WCC, was born and raised in Richmond. She now raises her family here. Over the past 10 years, she has been a school leader at parochial and public schools in West Contra Costa and Alameda counties. Under her leadership as principal of Glenview Elementary in Oakland, the school experienced double-digit growth in both Math and ELA on the California Standards Test (CST) and achieved the most growth in the district for African American students in Math in 2011. In her final year in Oakland, Natalie received the Excellence in Educational Leadership Award with an unprecedented number of nominations.